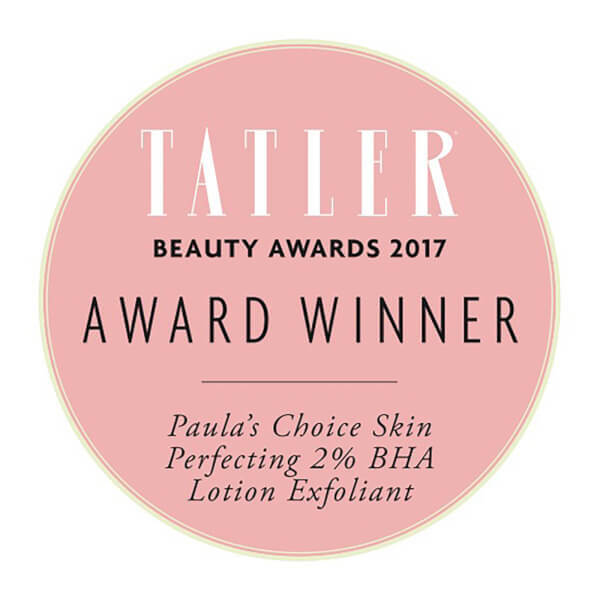 Achieve flawless skin with Paula's Choice Skin Perfecting 2% BHA Lotion Exfoliant, a silky soft lotion fortified with salicylic acid to help renew skin whilst moisturising and minimising pores. Absorbing quickly into the skin, the leave-on exfoliant targets both the skin's surface and deep down, sloughing away dulling dead skin cells whilst penetrating inside the pore to reshape and unclog deep within. Redness, blackheads and stubborn blemishes are addressed and reduced with 2% concentration of BHA. Its rich texture delivers deep hydration and exfoliation, increasing cell turnover so skin looks renewed and radiant with a more even tone. Blotchiness is banished. Salicylic acid harnesses antioxidant properties and increases collagen production; wrinkles appear reduced and skin feels firmer, younger, healthier. Suitable for all skin types, especially normal, dry and very dry skin. Apply once or twice daily after cleansing and toning. Apply a dime-sized amount over the entire face, including the eyes (avoid the lower lash line and eyelids). Aqua, Cetearyl Alcohol (thickener), Squalane (emollient), Glycerin (skin-identical agent), C12-15 Alkyl Benzoate (thickener), Glyceryl Stearate (thickener), PEG-100 Stearate (thickener), Salicylic Acid (Beta Hydroxy Acid, exfoliant), Epilobium Angustifolium (Willow Herb) Flower/Leaf/Stem Extract (anti-irritant), Camellia Oleifera (Green Tea) Leaf Extract (anti-irritant), Vitis Vinifera (Grape) Seed Oil (antioxidant), Prunus Amygdalus Dulcis (Sweet Almond) Oil (non-volatile plant oil), Beta Glucan (antioxidant), Tocopheryl Acetate (vitamin E/antioxidant), Panthenol (water-binding agent), Bisabolol (anti-irritanting agent), Sodium Lauroyl Lactylate (emulsifier), Xanthan Gum (thickener), Sodium Citrate (pH adjuster), Butylene Glycol (slip agent), Acacia Senegal Gum (thickener), Cyamopsis Tetragonoloba (Guar) Gum (thickener), Tocopherol (vitamin E/antioxidant), Sodium Hydroxide (pH adjuster), Ethylhexylglycerin (skin-conditioning agent), Phenoxyethanol (preservative), Sodium Benzoate (preservative).